A slightly crispy (and greasy) exterior. Check. Doesn’t all of the above remind you of a classic donut? To make the strawberry sauce: In a small processor, process the strawberries and icing sugar together as smooth as possible. Set aside while you move on to make the french toasts. 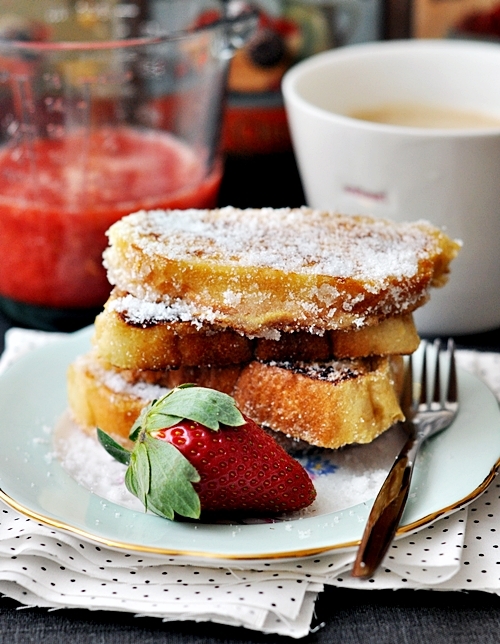 To make the donut french toasts: In a shallow bowl, whisk eggs, vanilla extract and milk with a fork. Soak the bread slices in the egg mixture until the bread feels soggy (however, Nigella’s instruction was soaking for 5 minutes a side). Then heat butter (if using) and oil in a frying pan. Fry the egg-soaked bread until golden and scorched on both sides ( I would suggest to do it over medium to low heat). Put sugar on a plate and dip the cooked bread in the sugar until very well coated. 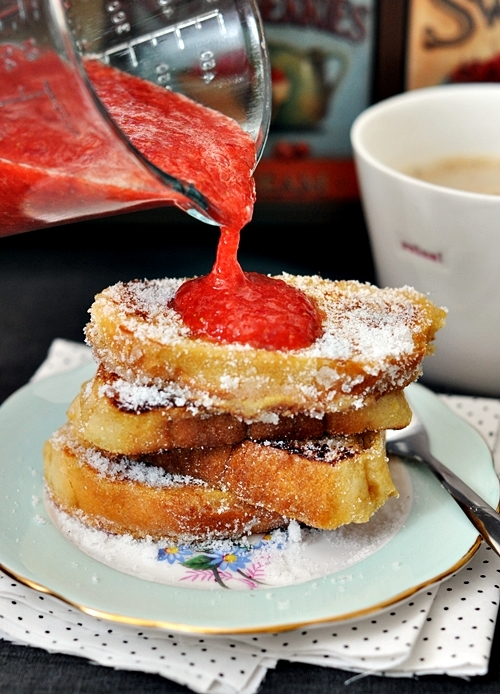 Serve immediately with drizzles of strawberry sauce. I’m inspired by this recipe, especially since I’m scared of deep frying! Love the instant strawberry sauce, too. This looks quite ridiculously good! 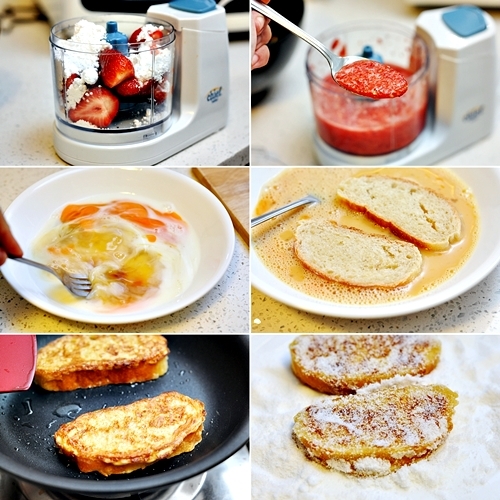 I’ll have to make this for brunch soon – my kids would love it. 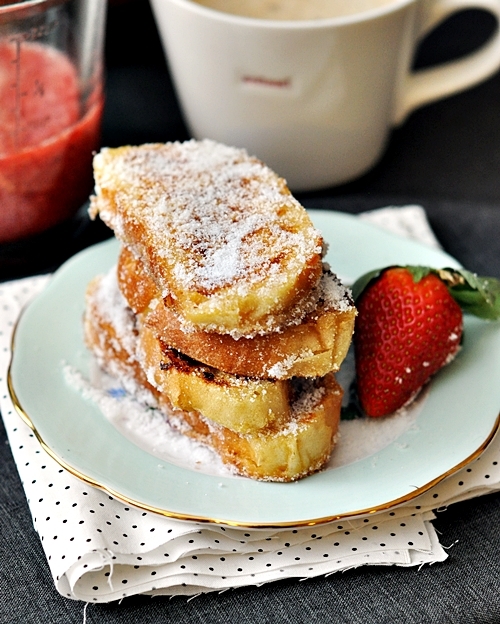 This recipe is a derivation of the famous Pain Perdu. A real addiction! Holy moly! That looks gorgeous! I love your blog and even if I eat low carb you recipes are fantastic! Can I put you on my blog roll? If you like my blog maybe you want to link to mine.